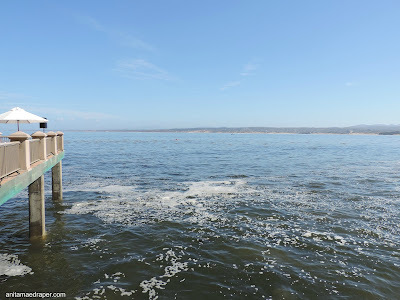 It's hard to believe that yesterday I awoke in beautiful Monterey, California, and today I'm back on the prairies and haven't seen a sailboat, sea otter, or a flash of brilliant blue water all day. 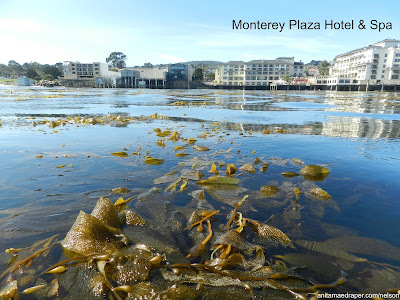 I was down in Monterey for the Books & Such Literary Management Retreat and this time, my husband, Nelson joined me on my wonderful working vacation based in the Monterey Plaza Hotel & Spa overlooking Monterey Bay, California. The view from our room was breathtaking and we spent many minutes taking photos of the plethora of boats, sunrises, and wildlife. Nelson was especially thrilled with the binoculars left in our room for our viewing pleasure. 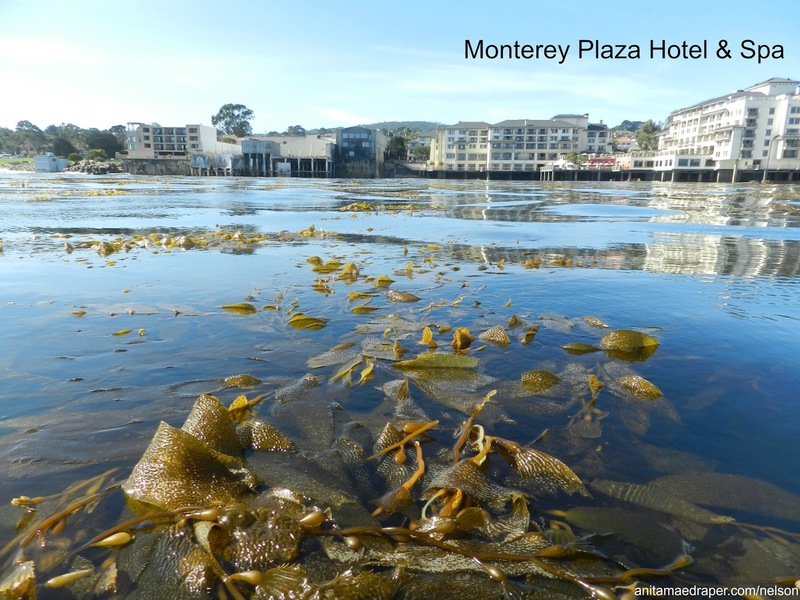 The Monterey Plaza Hotel is on Cannery Row which used to be lined with canneries. Some of these canneries are still standing and contain shops and boutiques. Next door to the hotel is one of these old canneries. It appears in many of my photos where it is adorned with gulls, pigeons, and cormorants. 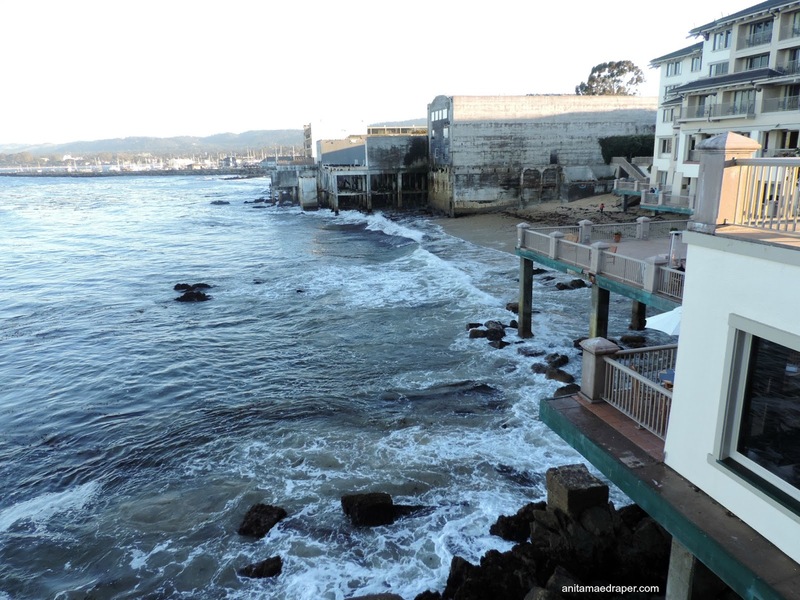 This next photo shows the hotel and next-door cannery with the Coast Guard Pier in the background. This beach was below our window and we could hear the surf pounding against the beach and brick throughout the day and night. 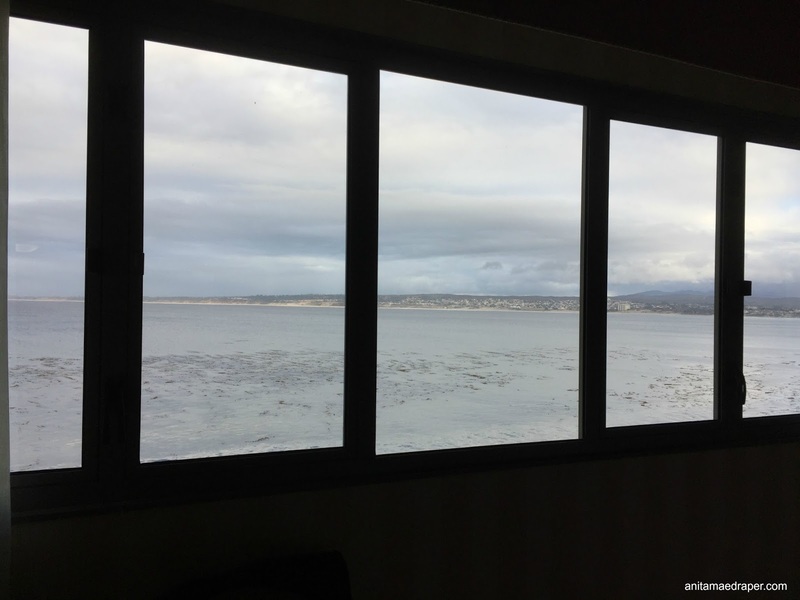 From our window, we watched the incredible sun rise while gulls and cormorants greeted the day and seals "porpoised" in Monterey Bay. 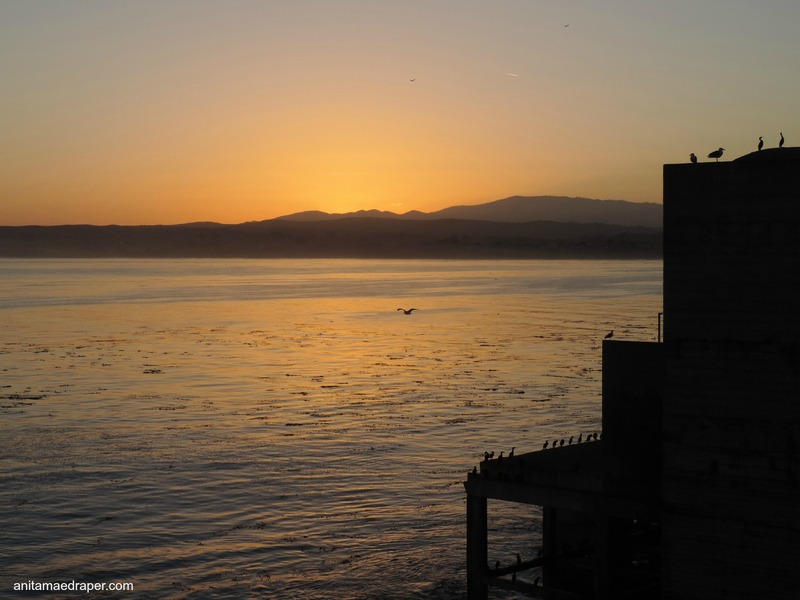 Here's a video showing seals and birds minutes before the sun appeared with its golden glow. 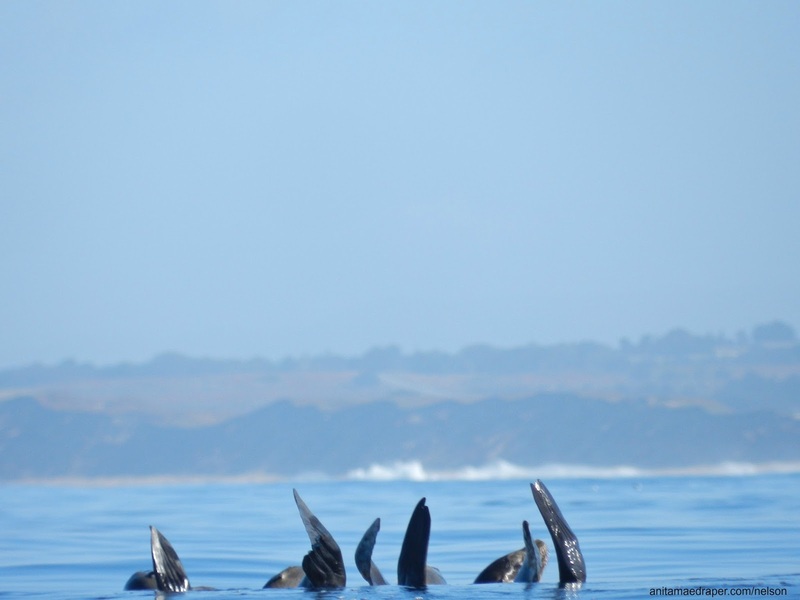 My camera recorded it fine when the seals were slicing through the water, but went out of focus when they dived under water. 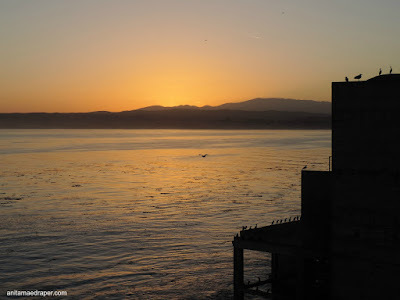 I couldn't be annoyed however, when the sounds of gulls and barking sea lions carried on throughout this short video I've entitled, Monterey Bay Wildlife at Dawn. And then the sun rose, washing the bay in light and exposing a thick layer of dew on every standing surface. 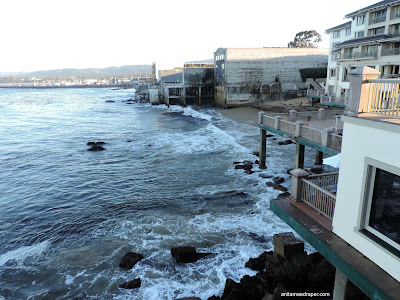 While I was busy with the agency sessions on the first day, Nelson spent his time exploring the area around the Monterey Plaza Hotel which included the infamous Cannery Row. On the second day, I was in session when I received a text message from Nelson which said, "Out here in kayak." Gawk! I slipped out with my camera and this is what greeted me. My camera proved its worth as I zeroed in on Nelson in a red kayak way out there, in the centre of this pic. 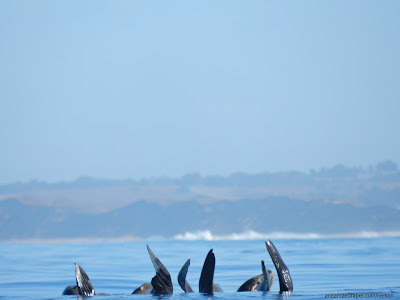 Nelson said he'd often heard wings flapping and water splashing while he was out there, but whatever had made the noise was gone by the time he turned around. This photo was a fun surprise for him, however, as he hadn't realized anything was there until I showed him the evidence. 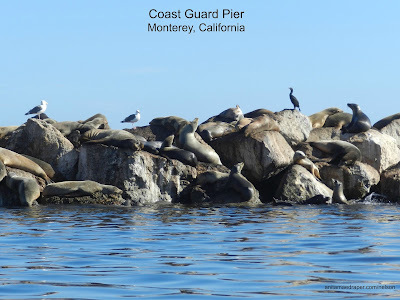 He took some astounding photos from the kayak including the one at the top of this post showing the kelp and hotel, and this one of the wildlife taking advantage of the sunny rocks on Coast Guard Pier which forms part of the Monterey Harbour. And after three full days in California, it was time to depart. I'll give you one last photo Nelson took while getting up close and personal with the wildlife while kayaking in the bay. I really enjoyed this second trip to Monterey, and a big part of that was that I was able to share the trip with Nelson and can now share the memory of it with him. 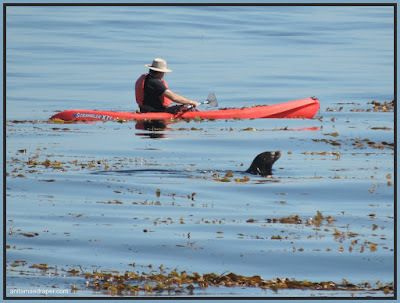 Between the photos we took this year, and those I took of my 2014 Books & Such Monterey Retreat, we have many images of birds and animals which we'll be showing on Pinterest, Facebook, and our Draper's Acres blog in weeks to come. I hope you'll keep in touch as we share our journey. 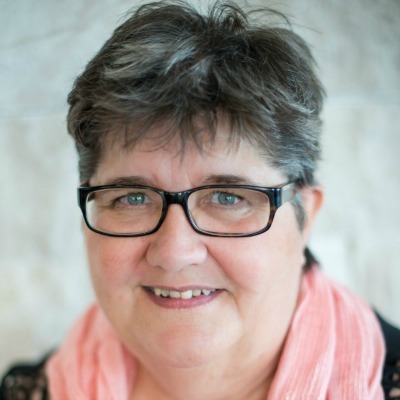 Anita Mae Draper's historical romances are woven under the western skies of the Saskatchewan prairie where her love of research and genealogy yield fascinating truths that layer her stories with rich historical details. 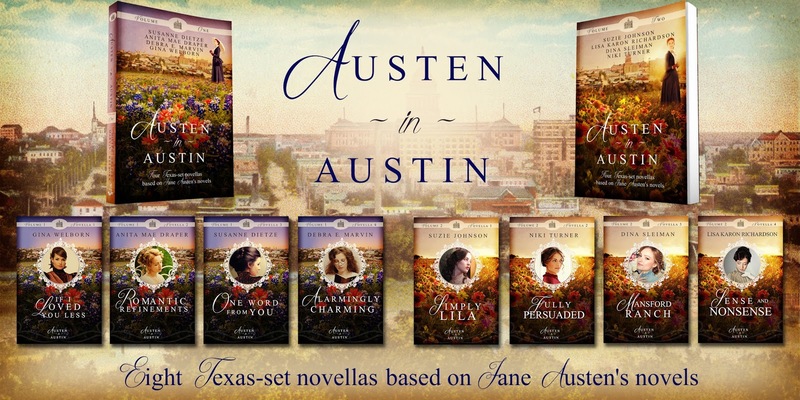 Her Christian faith is reflected in her stories of forgiveness and redemption as her characters struggle to find their way to that place in their heart we call home. Anita loves to correspond with readers through her contact page, or any of the social media links found at www.anitamaedraper.com. 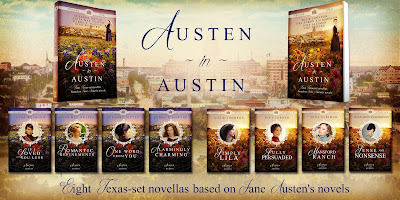 Readers can enrich their reading experience by checking out Anita's Pinterest boards for a visual idea of her stories at www.pinterest.com/anitamaedraper. Sounds like such a lovely trip. 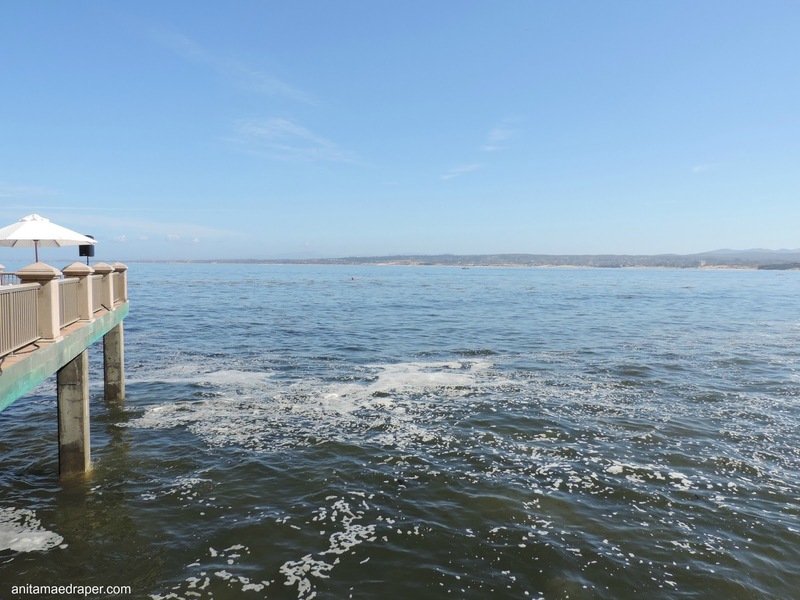 Monterey is kind of one of the best place in the US. It has lots of very good places and scenery as well as lots of things that you can do their to make your trip successful and memorable. I have been there once. There are places like the Monterey Bay Aquarium, Cannery row and many more. Thanks for sharing this lovely pic and your experience.